Other Codes Available Upon Request. Covers all aspects of plumbing. The general requirements include drain waste and vent systems, sizing and protection of water supplies, private waste disposal systems and gas piping and water heater installations. Designed to provide complete requirements for the installation and maintenance of heating, ventilating, comfort cooling and refrigeration systems. A self teaching aid and a must for apprentices. Compatible with the Uniform Codes. A primer on plumbing for novice and experienced and a must for the apprentice. 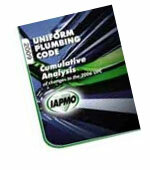 A valuable companion to the Uniform Plumbing Code Study Guide. 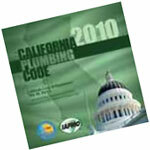 The California state amendments, based on the 2009 Uniform Plumbing Code, have been assembled into a convenient, single publication. Includes updates and errata pages. Hundreds of tables and diagrams are included into a convenient, single publication. The California state amendments, based on the 2012 Uniform Mechanical Code, have been assembled into a convenient, single publication. Includes updates and errata pages. Hundreds of tables and diagrams are included. 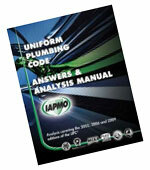 Organized by Chapters and Appendices, this Manual ia a valuable resource to Uniform Plumbing Code users who have questions about the specific meaning of code requirements for certain applications. The Manual contains interpretations created by the UPC Answers & Analysis Committee. The 2009 edition can be used with both 2009 & 2006 editions of the UPC. The UPC Cumulative Analysis identifies changes to the 2006 edition of the UPC that were made to develop the 2009 edition of the UPC. In addition, each change contains an analysis of the reason for the changes presented to the Plumbing Technical Committee. The Uniform Solar Energy Code was first developed in 1976 to address the growing needs of commercial and residential users of solar energy. This code is intended to provide a safe and functional solar energy system with minimum regulation. Clearly explains the details of the code! Includes chapters on piping, joints, thermal storage, collectors, thermal insulation, duct work and electrical components.